MOLLUSCA : NUDIBRANCHIA : Archidorididae SNAILS, SLUGS, ETC. Description: The body is chocolate brown in colour. The mantle bears numerous small white tubercles that form a reticulate pattern of ridges. The rhinophores have distinctive trumpet shaped sheaths. Grows to at least 68mm in length. 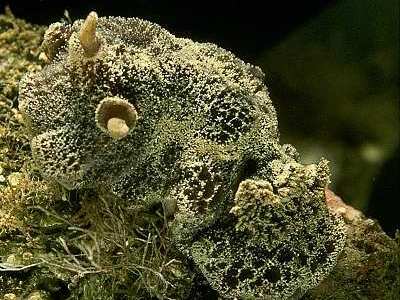 Habitat: A sponge eating dorid which has been found on steep rockfaces in about 8-15 metres depth. The exact diet is unknown. The spawn consists of a ruffled yellow ribbon of eggs deposited in a spiral of 11/2 turns. Distribution: This species is rare and the only British records are from the Lizard peninsula in Cornwall and the east coast of St. Mary's in the Scilly Isles. There is also one record from Banyuls on the Mediterranean coast of France. Distinctive reticulate pattern of tubercles. Picton, B.E. & Morrow, C.C. (2016). Atagema gibba Pruvot-Fol, 1951. [In] Encyclopedia of Marine Life of Britain and Ireland.